In the United States it is typical to throw a baby shower before the baby has arrived. However, with that being said if for some reason you are not able to have a shower before the baby is born don’t fret. Here are 4 reasons why holding the shower after the baby is born is better. Most baby showers are held at the end of a pregnancy when a mom is starting to feel the most uncomfortable. In the case of some difficult pregnancies the mom may even be on bed rest, which makes the party even more difficult. After the mother has delivered she will usually be feeling much better than the last trimester of pregnancy. If the shower is held after the baby is born the guests all get to meet the newest member of your family. They can all get to hold him/her and get to experience the baby for themselves instead of through pictures. Gifts are never demanded but are always nice. If the guests know the gender as well as the babies size they can make sure they buy appropriate gifts. This ensures that gift will not have to be returned as the new parents would have to if the shower was held before the baby was born and they are the wrong gender or size. In the case of adoption many parents may not know that they are going to receive a child until after the child is born. In this case it would be disappointing to not have the same type of celebration for parents who are adopting vs biological parents. 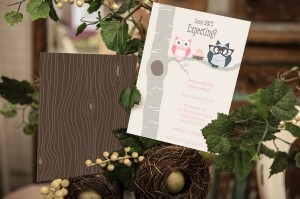 Before you send out the baby shower invitations having a new baby is a big change so make sure the family is settled and comfortable enough to have the shower. Newborns sleep schedules are not set, so neither will be the parents sleep schedules be set. So most likely the parents are going to be pretty exhausted. So don’t overstay your welcome.